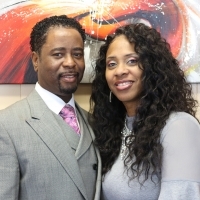 We want to thank you for visiting our Web site and also want to extend a personal invitation to welcome you to one of our Sunday Services or any other service at Living Waters Deliverance Ministries, Inc. where you will discover a worship service centered on our Lord and Savior Jesus Christ. Salvation, Healing, Deliverance is in THIS house. Come and see!! You are a vital part of God’s plan and we would love for you to come and join us in knowing God and making Him Known! On behalf of Pastor Victor Ferguson and Apostle S. Ferguson and the staff of Living Waters Deliverance Ministries, Inc., we want you to know that we are standing in agreement with you for God’s perfect will to be done in your life and in the lives of your loved ones. The bible says in Psalm 138:8 “The Lord will perfect that which concerns me; Your mercy, O Lord end, endures forever; Do not forsake the works of Your hands.” Your faith together with our prayers is sure to move the hand of God on your behalf. Please take the time to read Psalm 57 and begin praising God NOW for the answers to your prayers! !